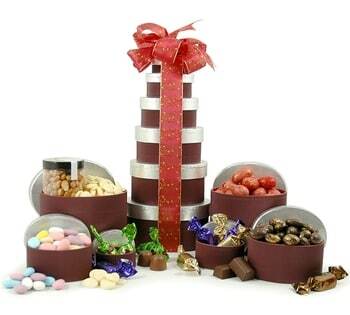 This little tower packs a lot of treats. Featuring creamy caramels, crumbly fudge and of course an abundance of chocolates – all waiting to be discovered inside three heart-shaped gift boxes. 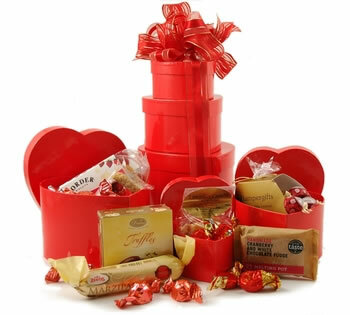 The Sweethearts Tower will arrive hand tied with red ribbon, ready to impress someone special. 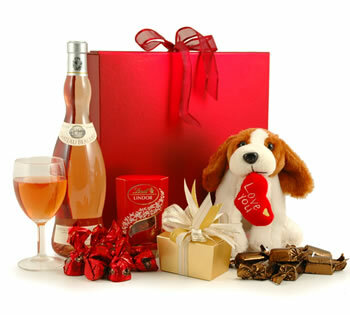 Sparkling wine… Cuddly toy… Chocolates… this one ticks all the right boxes for a charming romantic gift. And to top it all off the Romantic Surprise arrives beautifully gift wrapped with ribbon. Demolishing this elaborate construction will be a special treat! This stylish gift is beautifully finished with a hand-tied ribbon – ideal for chocoholics, chocolate lovers, and people who just like a chocolate surprise now and again. 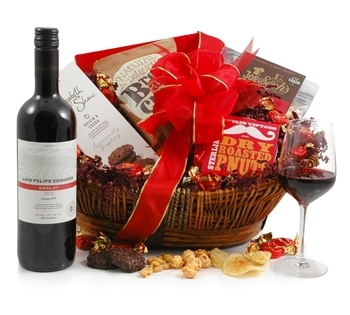 At the heart of our best selling wine hamper is a delicious medal winning Chilean Merlot. The Ruby is the perfect gift for a friend or colleague who enjoy a nice glass. Relax, run a hot bath and let our luxurious Bath themed tower do the rest. The white and salmon-pink gift boxes are re-usable and make perfect keepsake or storage boxes. A stunningly presented, pink-hued rosé from Château de Beaulieu arrives with an adorably cuddly, soft and floppy-eared ‘love you’ puppy. Open the metallic red gift box and you’ll also discover a mouth watering selection of Belgian & Swiss chocolates – just perfect for the one you love. 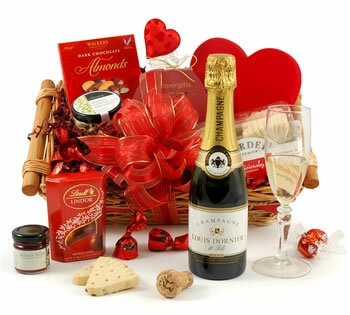 Pop the cork on the half bottle of bubbly to kick off Valentine’s Day in style. 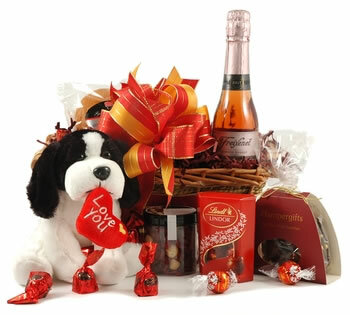 This exquisite basket arrives beautifully gift-tied with red ribbon. 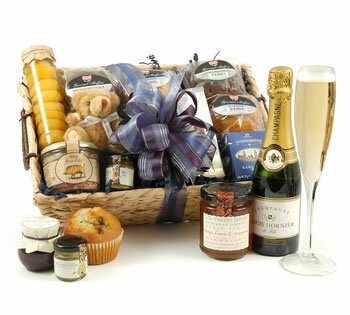 Serve the half-bottle of Louis Dornier Champagne alongside five American-style muffins in three mouth-watering flavours. Finish off with either fresh ground Brazilian coffee or brew up a cup of earl grey tea. 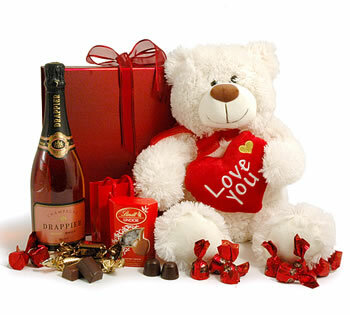 If you’re stuck for ideas for that special someone, look no further than our Giant Teddy and Champagne Gift. It’s the perfect way to lavish your loved one.